Billy Moore is a former rugby league player of the 1980s and 1990s representing both Queensland and Australia, usually as a lock of second-row. Growing up in Wallangarra in Queensland, Moore was born in Tenterfield, New South Wales, near the Queensland border as the hospital was closer than the one in Stanthorpe, Queensland. Moore has quipped “My Mum assures me I was rushed over the border before the oxygen had time to affect my lungs”. Moore represented New South Wales at under-17 level while in high school. He moved to the North Sydney Bears in 1989 and played in the club’s reserves premiership. Following a mass turnover of players, he became a regular first grader and helped transition the team from mediocrity to finalists in 1991. 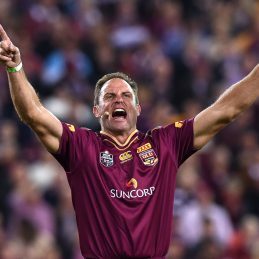 In 1992 Moore made his first Queensland State of Origin team, scoring the lone try in the Maroon’s 5-4 win in the second match of the series. Moore would play for Queensland for three seasons. In 1995, responding to a jibe from the New South Wales team that they would forcefully remonstrate with the first person that said they were a Queenslander, Moore famously repeatedly yelled ‘Queenslander!’ to motivate the team as they made their way out of the player’s race.